Batman is willing to die. While most superheroes are venerated for their acts of valor, few are willing to go down with the ship like Gotham's greatest hero. Though he is often celebrated for his epic victories, the Caped Crusader has a long and fairly unknown history of dying in the line of fire. Outside the world of comics, his near-death experience at the end of The Dark Knight Rises is perhaps the most popular example. Had Batman been unable to escape from the nuclear blast, the movie's grand finale would have made an appropriate addition to the pantheon of his ultimate sacrifices. Though it might be viewed as sacrilege to dwell on his losses, the truth cannot be overlooked: Batman has been killed on numerous occasions. He has suffered straight-shot bullets to the chest, death by electrocution, and multiple heart attacks. Doggedly refusing to break his “one rule” against the Joker, the Clown Prince of Crime hasn’t always returned the favor. Consider this piece a collection of the Caped Crusader’s most heroic final moments. Of all the truly great Batman stories, Neil Gaiman’s Whatever Happened to the Caped Crusader? ranks among the most moving. 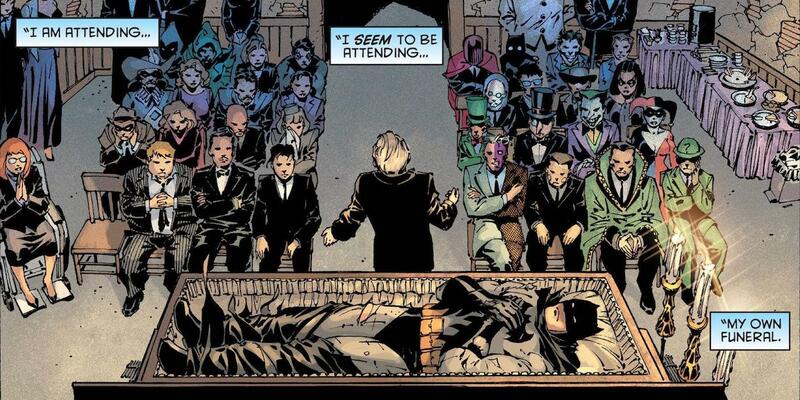 Following the events of Batman RIP/Final Crisis, Gaiman introduces us to a world where Batman is dead, lying inert in a humble casket in the backroom of a Gotham City pub. He’s surrounded by his dearest friends and most enduring enemies, all of whom take turns eulogizing the Dark Knight in their own way. This back alley watering hole is like the Noah’s Ark of Gotham, where the villains and heroes coexist alongside one another, united for a brief moment to pay respects to the man who bound them all together. Though each testament reveals the varying circumstances under which Batman was killed, they all share the same message: Batman always gave the last full measure of himself and was willing to die in the line of duty. In The Court of Owls, Batman gets brutalized in increasingly shocking ways. On the one hand, the actual “Court” of mask-wearing Gotham elites break him psychologically, allowing him to wander through their death-maze as they taunt him from the rafters. For once in his life, Batman is legitimately frightened. As he hallucinates in the deepest recesses of underground Gotham, he wonders how he’ll possibly escape the Owls alive. His mental breakdown is only part of the proceedings, however, as the Court sends in their prized assassin, the Talon, to kill him. Watching from above, the Owls shout down inventive ways for Bruce to die. As the Talon offers the coup de grace and boots him through a wall, the Owls prepare to descend and rip him to shreds. In a final burst of defiance, Batman uses the chemicals in a camera to blast a hole in the floor and expose an escape route in the river below. Though Batman escaped his death, he suffered a fatal heart attack that temporarily killed him. If Harper Row (Bluebird) hadn't found him in Gotham Bay and restarted him with jumper cables tethered to a nearby car battery, the tale of The Court of Owls would have surely been over. In the face of often insurmountable odds, Batman’s fealty to justice can often appear suicidal. Christopher Nolan’s The Dark Knight trilogy accurately depicted Bruce Wayne’s tendency to be reckless, but long before the 2000s, Batman would frequently toy with the afterlife. In the Golden Age classic, The Death Cheaters of Gotham City, Batman finds himself lusting to join the elite club after which the issue was named. The eponymous "Death Cheaters" consisted of daring members who had intentionally died for a period of time, visited the “in between,” then returned to life with a renewed perspective. Being the man-about-town that he is, Batman set his sights on joining this fraternity. His method of madness? Imbibing a deadly poison that stopped his heart from beating for several minutes. Pronounced dead as a doornail, Batman magically restarted his heart and came back to life just in time to protect his new brothers-in-arms from a jilted criminal who was denied entry into the "Death Cheaters" club. As this lowly crook would soon realize, fighting Batman was the #1 way to visit the afterlife. In Flashpoint: Knight of Vengeance, Brian Azzarello and Eduardo Risso flip the tables on the Batman myth. Rather than start their narrative with Thomas and Martha Wayne getting killed in a Gotham alleyway, Azzarello pens a story where a young Bruce Wayne becomes the victim of Joe Chill rather than his parents. Thomas Wayne beats the killer’s face to a pulp, and while his punches slow, he hears Martha sobbing behind him with the body of Bruce lying lifeless in her lap. Her anguish turns to tears, her tears turn to laughter, and her laughter becomes the very visage of the Joker. Devastated by their loss, Thomas and Martha deal with their crushing grief in equally disturbing ways, but it’s Thomas Wayne who directly seeks vengeance. The idea of Batman lives on. Fueled by the loss of his son, Thomas Wayne becomes a more violent and unrestricted Batman than we’ve ever seen, one who's unafraid to kill. According to his own self-assessment, Thomas Wayne’s Batman is “not the hero of this story. I’m a man who’s been corrupted by his own unbearable pain.” By the end of the Flashpoint series, the Wayne family would suffer multiple losses across time and space. “Only legends live forever…not the men who make them.” So ends the shocking finale of Adventure Comics #462, unambiguously titled, “Death of Batman!” In this two-part tale, we meet Bruce Wayne enjoying the fruits of his labor in a post-Batman retirement. While he’s relishing his time alone, he quickly gets shuttled out of his peace and quiet when the madman Bill Jensen takes down the Justice Society of America and summons Bruce to meet him high atop Gotham Towers. Though he shows up masked by his cape and cowl, our hero arrives on the scene just in time to catch the Flash plummeting to his death. Bill Jensen has thrown him off the skyscraper in a defiant act of war. Armed with an unwieldy source of magical power, Jensen keeps Batman at bay, even though the Caped Crusader fights alongside the hyper-powerful heroes Green Lantern and Doctor Fate. When he manages to slice open Batman’s mask with his super-weapon, Jensen recognizes Wayne’s unmistakable face. Along with his untamed explosive weapon, Jensen becomes enraged and loses control, “[consuming] him with a fire not seen on this Earth since creation…and the Batman dies with him!” Bruce Wayne's daughter, Helena, is forced to watch as her father perishes right before her eyes. Though he is one of the most popular villains in all of comics, the Joker is largely perceived as a twisted court jester rather than a sadistic clown. This is a fallacy. He has committed innumerable atrocities, not only against his lady love Harley Quinn, but against countless bystanders in Gotham and beyond. The Joker is a tremendously evil guy, and in Legends of the Dark Knight #65, he’s introduced in a raucous parade that moves before Gotham City’s guileless bystanders. Within seconds, of course, the Joker moves from a clown of the Ronald McDonald order to one more akin to John Wayne Gacy, blowing up the scene and leaving four pedestrians dead and nearly twenty injured. Batman is furious, but by the time he attempts to solve the crime and catch the Joker, he has already lost. At every turn, the Clown Prince of Crime is two steps ahead of the Dark Knight. When Batman comes close to catching the Joker, he’s left in a room booby-trapped with dynamite and blown halfway to hell. After the Joker finds his charred body, he pronounces him dead on the scene and throws his body into a nearby river. In Earth 2 #1, the world is overcome by Steppenwolf and his army of parademons (as briefly seen in Batman V Superman: Dawn of Justice). Across the world, the uncle of Darkseid himself has erected numerous towers that populated the planet with the monstrous creatures that have laid waste to countless countries. As long as these otherworldly structures stand, Earth will not. Representing the last line of defense, Batman, Superman, and Wonder Woman band together to fight back. While the Man of Steel took on the parademons and Wonder Woman led the charge (both dying in the process), Batman stuck to his detective roots and planned to sneak into the towers, destabilize their cores and render them useless, thus slowing the invasion of the parademons. Under cover fire provided by Robin (now his daughter, Helena), Batman infiltrates the central console only to learn that the self-destruct mechanism is the one way to bring it down. As with Bruce Willis talking to his daughter at the climax of Armageddon, Batman bids farewell to his child as he’s blown up in a final act of world-saving valor. Some of Batman’s deaths are emotionally charged and devastating; others will make you scratch your head in bewilderment. In Brave and the Bold #115, zany writer Bob Haney’s The Corpse That Wouldn’t Die, Batman meets a primitive fate via electrocution. On the hunt for a kidnapped woman, Batman gets zapped by a high-voltage window frame that basically kills him in a single shot. After getting his mind and body fried, Batman's corpse conveniently ends up in the same room as Professor Ray Palmer (aka the Atom), who recognizes the grave situation before him. Doing what he does best, Palmer shrinks down to become the minuscule hero and crawls into Batman’s brain. While inside, he commandeers Batman and basically turns him into a giant mech-warrior, controlling the still-dead body of the Dark Knight to continue looking for the missing woman. In the midst of this superhero seance, Batman is suddenly brought back to life thanks to the Atom's dance party inside his brain. In Flashpoint #5, we find Thomas Wayne’s Batman in beast mode. Possessed by the loss of his son, the withering of his own soul, and the alternate timeline that has threatened his sanity, this Batman 2.0 will kill everything that comes in his path. He even stabs Professor Zoom (the Reverse-Flash) clean through the chest with an amazonian sword. Though Barry Allen does his best to calm Batman and explain the purpose of the altered timeline, Batman is betrayed and attacked by Enchantress. Accepting his fate, Thomas spends his final moments building a connection between this timeline and reality. Knowing the Flash will return to the world in which his son continues to thrive, he entrusts Barry with a letter written to Bruce. When Thomas succumbs to his wounds, Barry delivers the letter to the original Batman, who bawls upon reading it. In his final words to his son, Thomas encourages Bruce to accept the reality he’s been given and move on from the tragedies of the past. Superman: Red Son is among the most fascinating and fun comics you’ll ever read. Its central conceit asks, “what would happen if Kal-El had crash-landed in the Kremlin, rather than Kansas?” The results aren’t good, and during the apogee of the Soviet Union, Superman becomes a cultural icon and the figurehead of the communist movement. Rather than be a reporter at the Daily Planet, Superman is a leading voice of Pravda, the Soviet Union’s propaganda mouthpiece. It’s the ultimate alternate universe, where America’s defining hero, the Man of Steel, becomes Russia’s biggest bargaining chip. Batman is also born in Mother Russia, though as in Gotham, his parents are killed when he’s just a small boy. During the rise of Superman, CIA spy Jimmy Olsen forgoes the camera for a career in special intelligence, tapping Lex Luthor as the man to bring down Kal-El. After his first few plans fail, Lex sends in Batman to finish the job. Though he intends to use Wonder Woman to trap the Man of Steel, Batman's best-laid plans crumble and leave him exposed. Rather than get stuck behind enemy lines and become a brainless lackey of the Superman Union, the Dark Knight pulls the rip cord and detonates a suicide bomb that removes himself from the situation entirely. One Batman is trouble enough, but multiple is guaranteed mayhem. In Batman #672, several Caped Crusaders populate Gotham and make a mess of the city. An impostor and seemingly robotic Dark Knight takes down the Gotham City Police Department, targeting Commissioner Gordon as the bargaining chip needed to draw out the OG Batman. When he finally arrives on the scene, our hero can scarcely yell out Gordon’s name before taking a bullet to the chest. Though the shell only ruptures his skin and doesn’t penetrate it, Batman then suffers a myocardial infarction that takes him to the one-yard line of life. Jim Gordon gets hit by a bullet as well, and as he falls, so does the Batman. The impostor (later revealed to be Michael Lane) leans over the incapacitated body of the Dark Knight and mutters, “Brain damage occurs five minutes after cardiac arrest…a lot can happen in five minutes.” Batman flatlines and ushers him into the hallucinatory state of mind some might call the afterlife. With Batman: Endgame, Scott Snyder and Greg Capullo have proven to have devious minds and strong stomachs. By breaking many conventions established in Batman and Joker lore, they spin a yarn that’s truly disturbing. The Clown Prince of Crime amputates Alfred’s hand, tortures Jim Gordon, and gives up on playing nice with Batman. Gone are the days of taunting and harassing, now replaced by a vicious and unbridled desire to kill the Dark Knight. In an underground cave, the Joker stabs him with blades, throws playing cards into his eye sockets, eviscerates his guts, and scalds his face. Electrocution is a fairly reliable way to dispose of the Dark Knight, as it turns out. In the 1992 issue of Detective Comics #644, Batman deals with a ghost from his past. Elmo Galvan, the notorious thief and murderer, is captured by the Caped Crusader and sentenced to die in Gotham. Death by electrocution takes him out of the world once and for all, but many years later, Galvan returns to the scene with a desire for vengeance. This time, he has weaponized the very electrical currents that once killed him, and he intends to unleash their fury on the man who sentenced him to death. When Batman pursues him in the Gotham sewers, he gets knocked out cold, captured by Galvan, then blasted with enough electricity to power a small country. The Dark Knight is dead. When Robin tracks him down and finds him without a pulse, he insists the Electrocutioner Galvan restart his heart. Against all odds, the crooked criminal agrees and brings Batman back to life. What would happen if the Joker got everything he ever wanted? This is the central question in Emperor Joker, a title that needs no explanation. After duping the eternally gullible Mister Mxyzptlk into surrendering 99.99% of his powers to him, the Joker changes the laws of the natural universe. He eats all of China, turns Superman into a dog, kills Jimmy Olsen by commanding robots to beat him to death with rubber chickens, and quickly proves himself to be the worst dictator in the history of mankind. Turning his sights to Batman, the Joker tortures his classic foe with great relish, killing him again and again. Like Prometheus was forced to die every day, Batman is repeatedly revived by the Joker then murdered in increasingly creative and sadistic ways. In one instance, he removes Batman’s ability to speak and orders hungry and malevolent buzzards to peel his flesh until there’s nothing left to eat. By this point, it’s easy to be inured to the many deaths of Batman. In Final Crisis, however, the Dark Knight’s last moments are as humbling and devastating as any in his entire career. When faced with the growing power of Darkseid, who has rendered all other superheroes useless, Batman jettisons his moral tenets to end his reign of terror. Though he has a strict no-kill policy, Batman aims his gun at Darkseid with confidence, knowing the radion bullet inside will atomize the villain on impact. Darkseid, threatened but still in control, asks Batman, “Little man, can you outrace the Omega Sanction? The death that is life!” Without batting an eye, Batman says “try me,” pulls the trigger and clips Darkseid clean through the left shoulder. With a wry smile on his face, Batman enjoys the moment: “Gotcha.” Unfortunately, Darkseid unleashed his all-powerful beams in time to fry Batman and kill him instantaneously. Superman’s pieta pose with the charred remains of the Dark Knight remains an unforgettable sight. Did we miss any of Batman's epic goodbyes? Let us know in the comments!